I moved this blog to www.thesalttooth.com. Please visit me there! Taqueria Arandas #5 is a Jalisco-style taqueria just south of Oltorf on 1st Street. I grew up eating Jalisco-style tacos in Chicago, and this place makes me feel right at home. The menu is big, and you can get breakfast or lunch all day. Someone brings you salsa and warm chips as soon as you sit down. I occasionally get tacos, but my absolute favorite is the avocado tostada. It's smeared with beans and layered with what's probably half an avocado, plus lettuce, tomatoes, Chihuahua cheese, and a big dollop of tangy crema. They're less than three bucks, and at that price, two people can get in and out of there with a full meal and a couple of beers for under $15. Their breakfast is an even better deal. Plates with eggs, papas, and tortillas are around three bucks. The food arrives shockingly quickly too. Often, I'll spy the waitress heading toward my table, and I think she must be coming back to ask a question when she's actually carrying my food over. One word of caution for vegetarians: the bolillos used for the tortas are made with lard. That made for a very sad Mr. M. when he found out. But my avocado tostadas still make me very, very happy. At a recent potluck, the host (my lovely friend at Green Door Hospitality) requested all the guests bring a sweet dish. She provided the savory dishes. My mother-in-law makes a silken tofu pie that's really delicious; made with just a few ingredients, it's surprisingly rich and satisfying. I've also had vegan chocolate pudding at a couple of potlucks, and liked it a lot. I knew there would be at least one vegan at the party, so I wanted to make something she could eat. Then I remembered another friend is gluten-free, and I wanted to make something for her too. So instead of my usual graham-cracker crust, I tried something new: a tortilla chip crust. I looked for recipes online, but didn't find any. So I ended up crushing up the chips finely in my food processor and adding sugar, coconut oil, and a bit of water to bind it. When the texture looked sandy, I pressed it into a pie plate and baked it until golden, about 15 minutes. While it cooled, I made the chocolate filling. It's a deliciously creamy mixture of melted dark chocolate, silken tofu, vanilla extract, maple syrup, and salt. The tofu really thickens the whole thing up and makes it very much like a chocolate-mousse pie. I was surprised and really happy with how well it turned out. The salty corn chip crust went really well with the chocolate, and it didn't get bogged down by the mousse. Preheat the oven to 350 degrees. Oil a 9-inch pie plate. Put all the ingredients for the crust into the food processor and pulse until well combined. Add water and pulse until the mixture just comes together. Press the mixture into the pie plate and bake for about 15 minutes, until slightly golden. Cool completely. Wash the bowl of the food processor before making the filling. In a large glass bowl, melt the chocolate chips in the microwave in 30-second bursts on half-power, stirring after each burst. Put the tofu in the food processor and process until very smooth. Add the maple syrup, vanilla, and salt and pulse to combine. Add the melted chocolate and puree until smooth. Pour the filling into the cooled crust. Chill in the fridge for 2 hours before serving. I eat a lot of tacos. Really, I love tortillas and hot sauce, so if I can have those, with some tasty fillings between them, I'm very happy. Tacodeli, which now has 3 locations in Austin, is one of my absolute favorite places to get them. I can't speak to the deliciousness of their meat tacos, but their vegetarian options are stellar. On weekends, they serve breakfast tacos all day, with lunch starting at 11. So on weekends, choosing only two (my usual portion) is not easy. They have tons of ingredients, and they're all very fresh and flavorful. It's tough to pick just a few. Usually, I start with their excellent roasted portabellos, and go from there. Seriously, they're thick cut, juicy, and earthy. Their eggs are really good too. They're from Vital Farms, a sustainable, happy-chicken-raising operation, which I definitely like. At lunch, there are two mushroom-based tacos: the Space Cowboy, with corn, peppers, fresh guacamole, and queso freso; and the Frontera Fundido Portabello, with onion-and-poblano rajas and Jack cheese. I love them both, but I go more often for the Space Cowboy. Then there's the Heather, one of my favorite tacos served anywhere. It's got smooth black beans and crisp lettuce, fresh tomatoes, guacamole, and its crowning glory: a big slab of griddled queso fresco. They don't mess around with the guacamole here, either. It's obviously fresh, and they pile on plenty. The Papadulce is another frequent choice. It's got roasted sweet potatoes, corn, toasted pumpkin seeds, and a sweet-spicy sauce. And everything is even better when topped with their Salsa Dona, a creamy jalapeno sauce that's pretty spicy, but super-flavorful. We get Tacodeli for lunch or brunch once or twice a week, and if they were open for dinner, I'm sure we'd be there twice as often. The food is fresh, local when they can get local ingredients, and pretty cheap for two people to have lunch. It's been warm in Austin, but last week it was a bit chilly. Chillyish. And when it's warm, I miss baking so during last week's kind of chilly weather, I made a pot pie. I'd seen a recipe on The Kitchn for a chicken pot pie with a poured biscuit crust. I prefer biscuits to puff pastry, so this seemed perfect. I only had to modify the recipe a bit to use what I had on hand, some seasonal vegetables from the market. Instead of The Kitchn's veggie blend, I used: carrots, onions, Jerusalem artichokes, Japanese turnips, cremini mushrooms, and shelled edamame. And in place of the sherry, I used 3 tablespoons of vinho verde. I also used coconut milk in the crust recipe, and almond milk in the sauce recipe, since that's what I had on hand. The result was crazy good. We ate it for days, even on the warm evenings, and it was just as a pot pie should be: savory, warming, and very comforting. This one's going into regular rotation during our non-summer weather. Oh man, I love Brussels sprouts. Even as a child, they were one of my favorite vegetables. My mom used to get the frozen ones that comes packed in a butter sauce, and eventually switched to growing them in her large backyard garden. I had never seen anything like the giant stalks with the little sprouts popping out all over them. 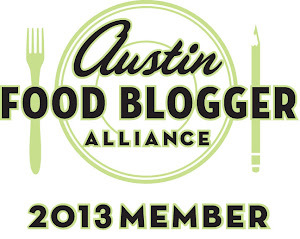 Now they’re super trendy on restaurant menus in Austin. I’ve been enjoying them at East Side King (at the Liberty), and at Uchiko for quite a while, just to mention two places. And their preparations are much more piquant than the simple roasted-with-butter one I usually make at home. Today, I tried something new, a piquant Brussels sprouts recipe of my own. 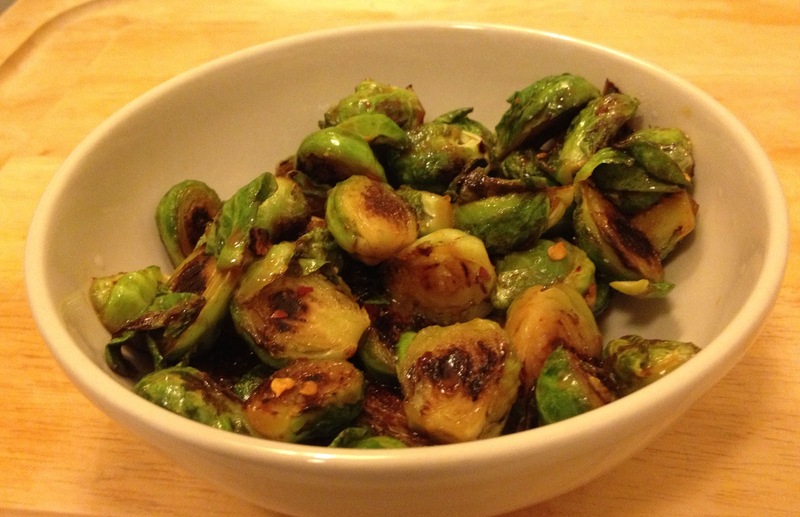 With a bunch of ingredients I had on hand, I whipped up a quick sauce that I glazed the panfried sprouts with. Holy cow, they were good. The sharp sauce was a great complement to the strong flavor of the vegetable. The Brussels sprouts came through all earthy and sweet, and the sweet-sour-salty-spicy glaze matched it perfectly. Whisk together the miso, soy sauce, brown sugar, chili flakes, and lemon juice. Set aside. Heat the oil in a frying pan over medium-high heat. Add the Brussels sprouts. Try to get them cut-side down, to help maximize the browning of the cut inner leaves. After about 3 minutes, flip one over and check for browning. If it’s well browned, from the center to the outer edges, stir and keep frying for another 5 minutes, stirring occasionally until they’re just beginning to get tender. If it’s not yet browned all the way across the cut side of the sprouts, keep cooking for another minutes before beginning to stir. Turn the heat off and pour the miso mixture over the Brussels sprouts. Stir to coat and serve. This weekend's downtown farmers market was small. All the venders lined just one street, and I was a little worried there wouldn't be much to be found. I was glad to be wrong. There were plenty of folks with fresh fruit and veggies. I got a beautiful bunch of carrots from Bar W Farm, and couldn't wait to use them. Coconut, to me, is one of those foods that can make almost anything delicious. The creamy, tropical flavor is one of my favorites. And I thought it'd go really well with the sweet, juicy carrots. Lick Ice Creams, in South Austin, has a carrot-tarragon flavor that I adore. It's sweet and a little herbal, and really nice and creamy. That inspired me to try tarragon in my soup. Though it used only a handful of ingredients, the soup was a success. It was earthy and creamy, with the delicate anise flavor from the tarragon shining through. Next time, I think I may try orange or tangerine juice in place of the lemon, just to switch things up. In a small pot, combine the coconut milk with 1 tablespoon of the tarragon. Cook over low heat, stirring occasionally, until it begins to simmer. Turn the heat to very low and continue cooking, stirring occasionally, for 15 minutes. Turn the heat off and let the tarragon steep in the milk. Meanwhile, chop the carrots in bite-size pieces. (This is just to increase the surface area of the carrots. They'll be pureed at the end, so don't worry about them being attractive.) In a large saucepan, heat the oil over high heat. Add the carrots and a pinch of salt and cook until they're beginning to brown, about 10 minutes. Add the vegetable stock to the carrots, and simmer until the carrots are tender, about 10 minutes. Pour in the coconut milk, add the remaining tarragon, and stir to combine. 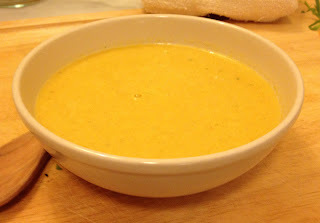 Turn off the heat and puree the soup with an immersion blender. Stir in the lemon juice and zest and serve. I'm Chris. I am a writer, editor, and copy editor. I love to eat local, seasonal, and clean food. Here's some stuff I like: cooking, eating, writing, reading, good punctuation, cookbooks, pens and pencils, sticky notes, lists.